Vets, active soldiers, and friends take note!...If you don't see what you want, please let us know. We can make a design that contains any unit patch, vehicle, or operation, just the way you want it. Email us at: info@militaryvetshop.com. These t-shirts, sweatshirts, hats, mugs and stickers feature the photo-realistic drawings of the ships, aircraft, and submarines of the United States Navy. This section of Military Vet Shop was opened in September of 2011. We are currently in the process of stocking designs that feature all of the naval vessels for our USN vets. If you don't see your ship, or your patch, email us with your request. Requests go to the top of our "to-do" list! Show your Navy Pride with Silent Service submariner designs. Show your Navy Pride with these Aircraft Carrier Navy Veteran designs. 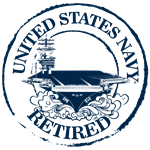 Show your Navy Pride with these Aircraft Carrier Navy Retired designs. Show your Navy Pride with these Submarine Navy Retired designs. The USS Abe Lincoln (CVN-72)"Abe"
The USS Carl Vinson (CVN-70)"Gold Eagle"
USS George Washington (CVN-73)"GW, G-Dub"
USS George Washington (SSBN 598)"The Georgefish"
The USS Independence (CV-62)"Freedom's Flagship"
The USS John C. Stennis (CVN-74)"Johnny Reb"
God created beer so that the US Navy Submariners wouldn't take over the world! Are you the proud Mother, Father, Aunt, Brother, Son or Wife of a Sailor? Show your US Navy Veteran Pride with this bold design! Show your Navy Pride with these Silent Service designs. Navy submarine with text: There are only two kinds of ships…Submarines and targets! Special requests from our Navy Veterans.